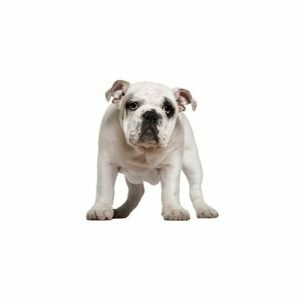 The Olde English Bulldogge is a recently created American dog breed. In the 1970s a true-breeding lineage as a re-creation of the healthier working bulldog from early nineteenth century England was created. Using a breeding scheme developed for cattle, the English bulldogs was crossed with American Bulldogs, American Pit Bull Terriers and Bull Mastiffs. The result was an athletic breed that looks similar to the bulldogs of 1820 but also has a friendly temperament. Olde English Bulldogges are docile, but capable and protective, fearless and athletic, fierce-looking, determined and courageous, bold and friendly around their family and friends, but fearless adversaries to anyone who threatens their masters or property. This breed likes to chew. Rawhides, soft rubber and stuffed toys are unsafe, for they are easily shredded or swallowed whole. Olde English Bulldogges are so eager to please that they may overexert themselves in an effort to do whatever is asked of them. An owner who displays a natural authority toward the dog, socialization and obedience training are important. It is best to channel high energy individuals to some type of work and exercise. The objective in training this dog is to achieve pack leader status. It is a natural instinct for a dog to have an order in its pack. When we humans live with dogs, we become their pack. The entire pack cooperates under a single leader. Lines are clearly defined and rules are set. Because a dog communicates his displeasure with growling and eventually biting, all other humans MUST be higher up in the order than the dog. The humans must be the ones making the decisions, not the dogs. That is the only way your relationship with your dog can be a complete success. This breed tends to drool and slobber. Are you interested in purchasing a Olde English Bulldogge?